Your safety and enjoyment are our priority so we’ll provide all the safety equipment and instruction you need for both your Mt. Batur sunrise trek and river rafting. Choice of rivers include thrilling rapids or a slow scenic drift the whole family can enjoy. It’s almost too much fun for one day. A perfect adventure package for those who can’t decide between volcano trekking and white water rafting. 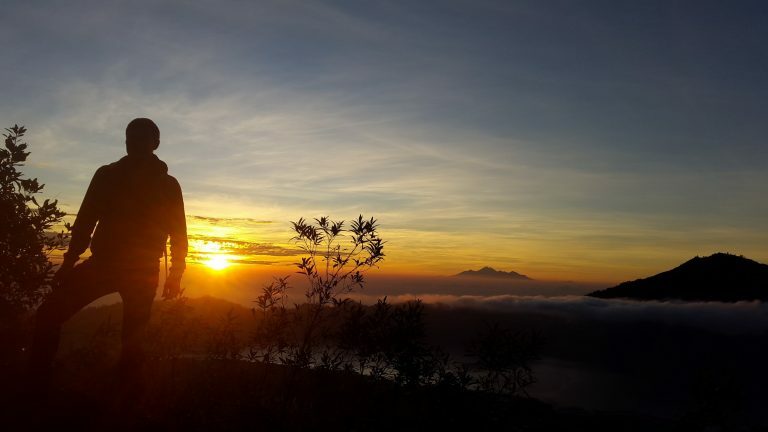 Enjoy the best of both worlds; a sunrise volcano trek up glorious Mount Batur and it’s incredible views. 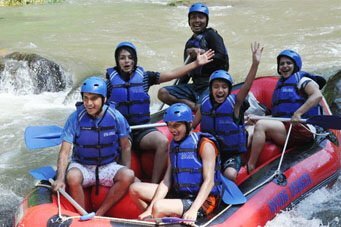 Then, get ready for a thrill as you head down either the Telaga Waja or Ayung river for white water rafting. Doing both is almost too much fun for one day. A fun and safe adventure for the entire family with our licensed and local guides. 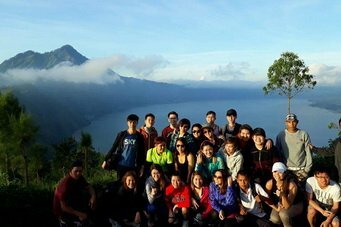 This is a 5-star trek with Bali’s most experienced Batur trekking guides. Be sure to bring your camera because you’ll be making memories you’ll cherish for a lifetime. This is a great way to spend your holiday while experiencing many aspects of our beautiful island. The only thing more important than your enjoyment is your safety. Book with us today while space is available. We’ll pick you up from your hotel in an air conditioned van. There’ you’ll meet your English-speaking guide who will brief you on safety procedures as well as the history and culture of the local area. Feel free to ask any questions along your trek as our guides are knowledgeable about local customs. 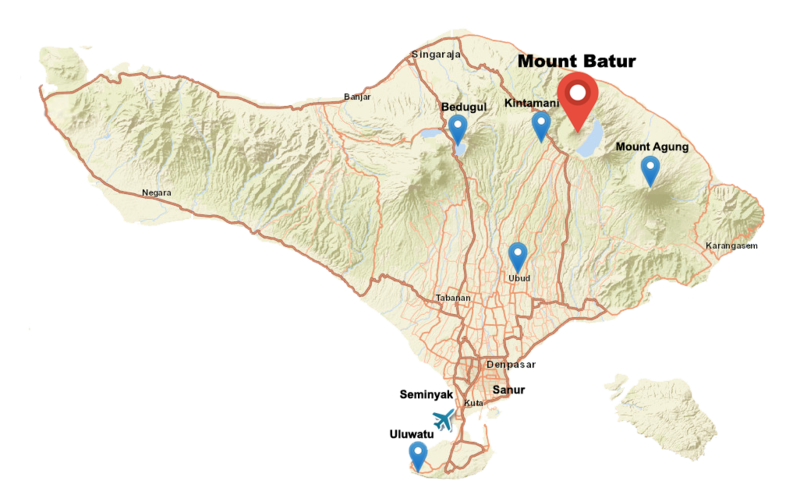 Mount Batur is part of the UNESCO Global Geopark Network and an active volcano. You’ll begin your ascent while it’s still dark at Toya Bungkah village under a blanket of a million stars. Our guide will provide you with working flashlights for your safety. You’ll reach the summit in plenty of time to capture the sunrise over the beautiful lava valley. Here, our guide will help you get the best photo opportunities and provide you with water, coffee, tea and a meal cooked over hot steam from the volcano. You’ll then wind your way around the crater and back to the village where you’ll board the bus to the river. Before you leave, the guide will give you informed options on two different rivers, the Telega Waja and the Ayung. You’ll get to choose which river suits your preference. After a short ride, you’ll arrive to the river where you’ll meet your river guides and undergo additional safety checks and basic rafting instructions before you climb into your raft and embark on the second part of your adventure. You’ll spend two hours enjoying class II and class III rapids on the Ayung and Class III and IV if you choose the Telaga Waja–as well as more of the Bali jungle and scenery. In addition to the wildlife and nature, you’ll also see majestic waterfalls and ancient stone carvings. You’ll end your rafting adventure near the town of Ubud where you’ll receive a welcome beverage. By now, you’ve worked up quite an appetite so once everyone is dried off and ready, you’ll make one last stop for an Indonesian buffet lunch. After lunch you’ll be taken back to your hotel where you’ll have time to wind down by the pool or even do some sunbathing at the beach. 01.30- 02.30 AM: Pick up time (depends on your hotel location). 9.00 AM: Board the bus to the river. 9.30 AM: Stop at coffee plantation on the way to the river. 10.30 AM: Safety check and white water river rafting. 1:30 PM: Finish rafting and head to an Indonesian lunch buffet and beverage. 2:30 PM: Board the bus back to your hotel. All other charges, including the entry fee to Mount Batur as well as the river fee, are included in your package. Because these tours are limited, we require a minimum of two guests per trek. If you want to book as a solo guest, we must add a 50% fee to the cost of the package. Tips are not included, nor are they required; however, our guides will be grateful should you choose to tip them for valuable service. If you have any questions or concerns regarding safety, please contact us attrekkingexploration@gmail.com. 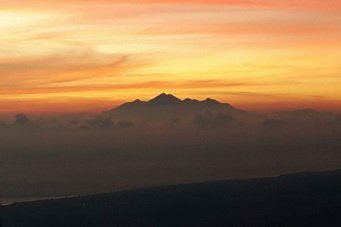 I’ve made it all the way to the summit of Batur, can you guarantee that I see the sunrise? No. Unfortunately, we cannot control the weather and at high altitudes, predicting it gets very tricky. Fortunately, no guest has ever been disappointed with the trek. The views are spectacular regardless of weather conditions. 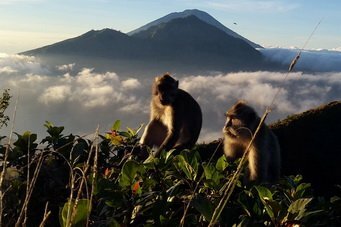 Is it really necessary to hire a guide for Batur? 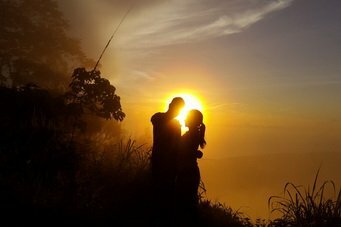 Mount Batur gets a lot of positive reviews in trip Advisor. Any negative feedback from trekkers almost always results from people who decided to trek it alone. it is perfectly legal to do so, but not advisable. Hiring a guide will help you get the best views, the most education about the history and culture of the area and will prevent you from getting lost. Furthermore, if you are injured, you’re more likely to get assistance as well as insurance coverage if you have a guide. Finally, the locals are very protective of the volcano and may be a little aggressive if you try to trek it without a guide. 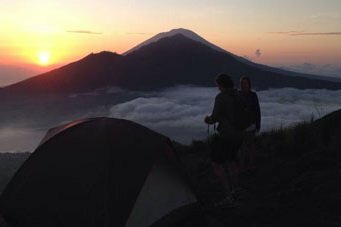 Are we allowed to camp on Mount Batur? Yes. 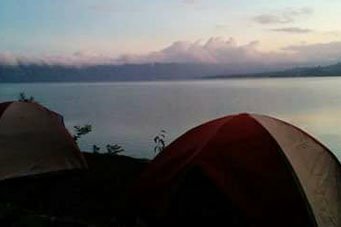 Mount Batur camping is highly recommended. Waking up to the sunrise is even better than climbing up to see the sunrise. Please contact us if you want to camp and do white water rafting in the same trip as this is a special package. Please do not drink any water in Bali that is not filtered. You will almost certainly get sick. We know that in some Malukat ceremonies, the Mangku will have you drink the water from the river, but without the protection of the Mangku, drinking water from the river is not advised. Yes, but please let your guide know at the time of booking how old your children are. Even though we provide life vests and helmets, we do not advise this package for children who cannot swim. Are there any crocodiles or snakes in the river? No. These creatures are very rare in this area. Snakes can be found anywhere in Indonesia, but on these treks they are rarely, if ever seen. Injuries rarely happen with this package. If an accident does occur, there are both mountain rescue and river rescue teams that are available to help guests in any emergency situation. If an injury occurs, our guide will immediately assess the situation and make a call to the rescue team for assistance. If needed, next of kin will be notified and we will help the injured person return safely back to their hotel. We know our guests often don’t want to see a lot of other tourists so our guides make every effort to find trails and views that are less crowded. Sometimes the crowds cannot be avoided, but our guides have enough experience to make sure you still enjoy your time. The river is limited to a particular number of tour groups so overcrowding is not a problem.